Another rare celebrity endorsement, and not for a stereo camera. This one is for Bolex, an expensive precision-made european movie camera. I don't recall ever seeing any other celebrity endorsements for Bolex products. 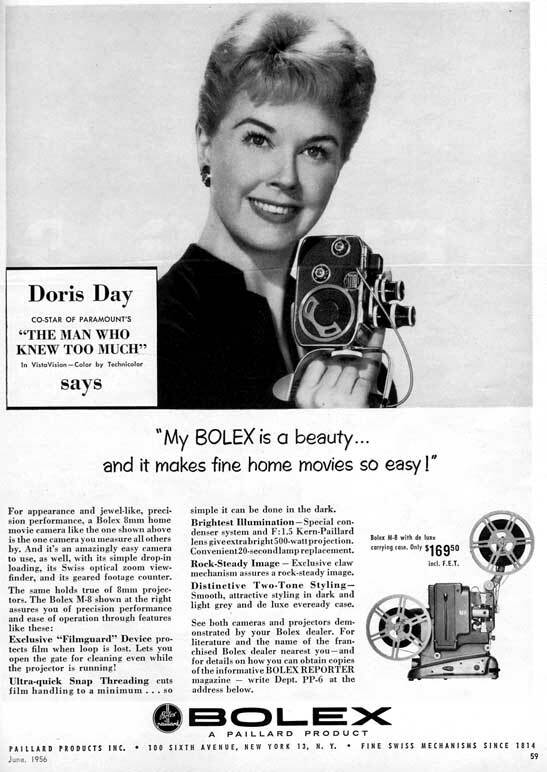 Of course, Doris just appeared in "The Man Who Knew Too Much," so there's a bit of cross-promotion going on. Since the movie takes place while she and her family are on vacation in Morocco, I'll have to watch it again and see if she's shown making home movies with this camera. Exakta ran an ad when "Rear Window" came out, since James Stewart was using one with a long lens to scope out his neighbors.